I received my costume today. When I opened the package and took the dress out, there were a few issues. 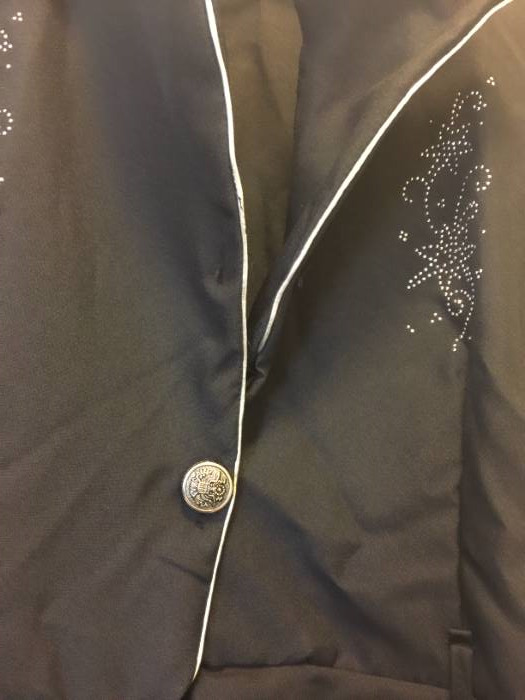 The top rhinestone button was missing. There's a 2 to 5 inch section below the belt that either ripped or wasn't sewn up. It's a cute little dress. 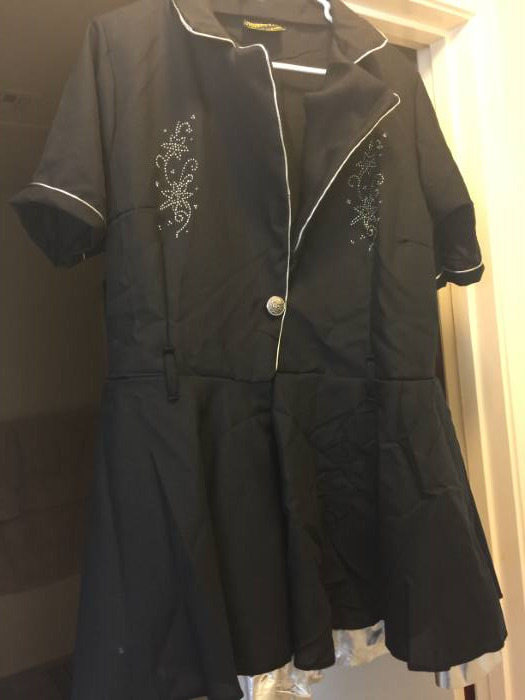 The pictures show the entire dress, the missing button and than the section that's ripped or wasn't sewn. when my wife got all of it she fell right in love with everything,. This looks like it will be an adorable costume... once my small arrives. I am 5'2", approximately 140 lbs, my measurements are 39-29-39, my dress size is 8/10, and my cup size is 34-D. I wear a size large, or even extra-large, in most costumes, so I bought a large. I just received it and it is enormous!! You could fit two of me in it. Seriously - I may give it to one of my friends who wears a size 22/24. Hopefully the small will fit better though, because other than that, it's darling. The cut looks good, and I think it will drape well enough. The petticoat you see in the picture is attached and floofy enough that you won't need to buy another one like you need to under some costume dresses. The fabric is thin, and I doubt it will hold up to lots of laundering, so if you're someone who will need this costume over and over (say, if you are a regular square dancer), I'd pass on this one.. but if (like me) you will be using it as a costume that you will wear a handful of times, go to town! It's well worth the price. Also, if you're concerned about modesty, the top of the dress should cover enough for you to be comfortable in it. I can't speak much to the length, because what little height I possess is all in my torso, but on a shortie like me it hits just barely above the knee. Long enough to be work-appropriate if for some unfathomable reason you wear cowgirl costumes to work. (If you *do* wear cowgirl costumes to work, and are not an actual cowgirl, please post a review because I'm sure we would all like to hear that story).